Arino Maker Returns is an Event Course in Super Mario Maker designed by Shinya Arino of the Japanese TV show GameCenter CX, and was released on November 4, 2015. It is one of three Event Courses to unlock the Arino KACHO Mystery Mushroom costume upon completion. The level begins with many Bill Blasters firing various enemies. 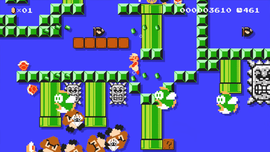 A Hidden Block that contains a Super Star can be found, and Mario must make his way through the winding path to find a ? Block containing a Fire Flower. Mario must then head across many warp pipes to reach an upwards path, and continue heading directly right to the Goal Pole. This course was made by Arino KACHO, from the popular Japanese video-game variety-show GAMECENTER CX. Here's a comment from the KACHO himself: "This course came from my desire to take a leisurely swim through an underwater level. In addition to the main path, there's also an easy route—see if you can find it!" This page was last edited on August 26, 2017, at 10:05.